The book presents the Slovenian constitutional review that was introduced by the Slovenian Constitution of 1963 following the European/German/concentrated/ continental/Kelsen's model of constitutional review. 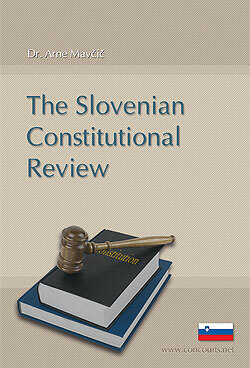 In addition to the Court’s stronger position within the scope of the national system along with the power to decide constitutional complaints regarding violations of human rights, the book speaks about the most important novelty of the Slovenian system in comparison with the Slovenian past and with other respective systems of the New Democracies. This is the Court’s conspicuous cassatory function with reference to the law; under the Slovenian 1991 Constitution in force the Constitutional Court may abrogate the law. Additionally, the book will introduce you to the transitional role of the Slovenian Constitutional Court which was exercised by the Court in the period after 1991. In terms of contemporary trends, the Slovenian Constitutional Court has assumed not only the role of a negative Legislature, but sometimes it took the positive role. In the period of transition the Legislature was not always able to follow developments nor to impose the standards for all deficiencies of the legal system and its institutions. This resulted in the so-called interpretative decisions taken by the Court or the appellative decisions or certain declaratory decisions that include certain instructions by the Constitutional Court to the Legislature on how to settle a certain question, or a specific issue. However, in compliance with the Principle of Judicial Self-Restraint, a clear limit has been imposed on the Slovenian Constitutional Court due to the fact that the Court actively creates the legal rule both negatively (e.g. by abrogation) and positively (e.g. by appellative, interpretative and declarative decisions), a function theoretically reserved for the Legislature. On the other hand the book deals with the question whether the Constitutional Court, in deciding on the existence or non-existence of a specific provision, actually creates the law, because it carries out a review of legislative activity. Finally, the book is focused on the gradual limitation of the access of individuals to the Constitutional Court. The currently adopted procedural changes introduced more strict criteria, allegedly due to the necessary enforcement of the right to a trial without undue delay. Accordingly, the previous broad individual access to the Constitutional Court was deemed as not indispensable; on the contrary, human rights and fundamental freedoms protection may be provided by several ordinary courts during the earlier stages of the respective procedure. Therefore the limited access would not cause much harm. On the other hand, the absence of observation of all welcome effects of the ("full") access to the Constitutional Court obviously leads to the interpretation that the state bodies alone are of the greatest significance. However, the state bodies’ service (actually paid for the benefit of citizens) has been repeatedly ignored. Furthermore, such ideas disregard the fact that the state bodes are "only tools". The state governed by the rule of law shall improve the harmony and greater exactness of legal rules which shall be in service of people. Therefore the legal theory should focus on the individual. Such broad individual access to the constitutional review contributes to the protection of human rights and fundamental freedoms, it accelerates the democratisation of any legal order and it promotes the state governed by the rule of law. To conclude, the book stresses that some broader individual access to the Constitutional Court stimulates the democratisation of the legal order whereby the citizens have an opportunity to initiate a direct and immediate control over the legislative, executive and judicial state power. Anyone's right to initiate the supervision is undoubtedly one of the basic elements of authority. Therefore, it would be necessary to focus on the estimation how the limitation of the individual access to the Constitutional Court could reduce the democratic character of the legal order.